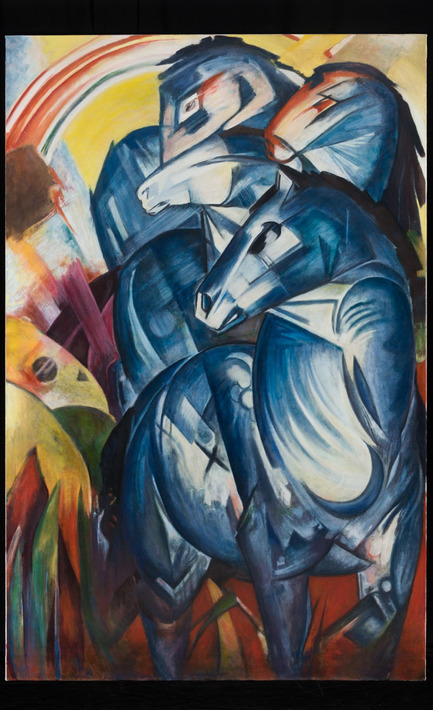 Franz Marc painted the expressionist work The Tower of Blue Horses in 1913. It was bought by the Berlin National Gallery after World War I and exhibited until 1935, when it was taken from the Gallery by the Nazi’s. Different accounts suggest that the painting may have survived the second World War but its eventual fate remains a mystery. 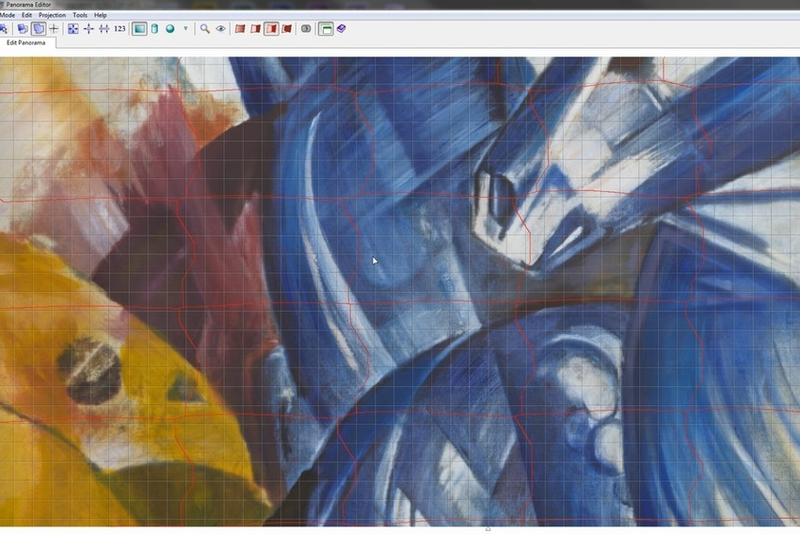 One preliminary sketch survives – a postcard to the poet Else Lasker-Schüler – as well as a low-quality image of the painting. Given the type of information available on The Tower of Blue Horses, as well as the fact that Marc’s paintings tended to have little relief, its re-creation was carried out almost entirely through physical, rather than digital, means. The low-quality image of the painting was blown-up and printed on canvas. This print was used as the base for the physical re-creation and guided Factum’s artist in painting. However, although the forms were relatively easy to capture, the colour proved more complicated. Several versions were painted but none seemed to reproduce the brilliant colour of Marc’s work. The decision was taken to travel to Germany in order to see more of Marc’s work up-close. 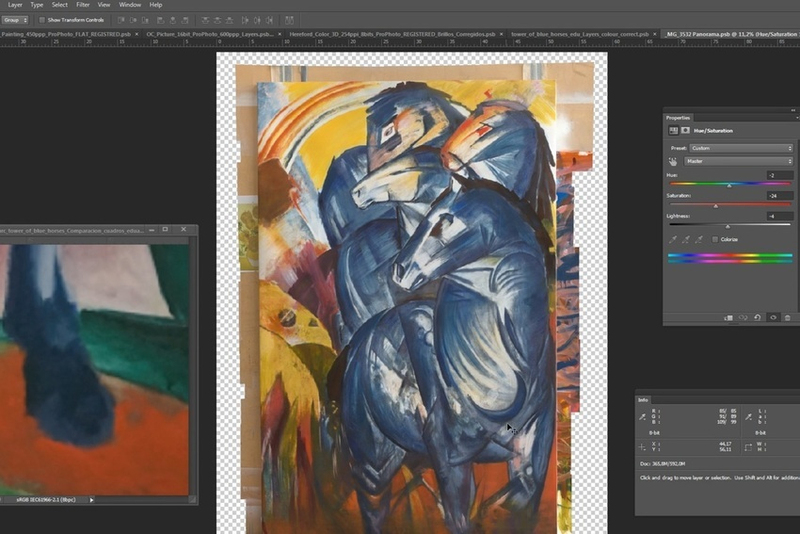 The Pinakothek der Moderne in Munich holds an extensive collection of German Expressionist works, including several by Marc, one of which is the postcard sketch for The Tower of Blue Horses. Factum’s artist closely studied Marc’s palette and the way he used colour. Physical colour references were also taken as another way of studying Marc’s tones. This means that ‘colour-sticks’ – literally strips of paper painted in a large array of colours and shades – were photographed alongside corresponding colours on Marc’s paintings. Different colours on a painting or object are matched to a colour stick of the same shade; a photograph is taken to record the position of this colour on the painting. Although it is possible to digitally record ‘true colour’, physical colour references really ensure accuracy in different lighting conditions. 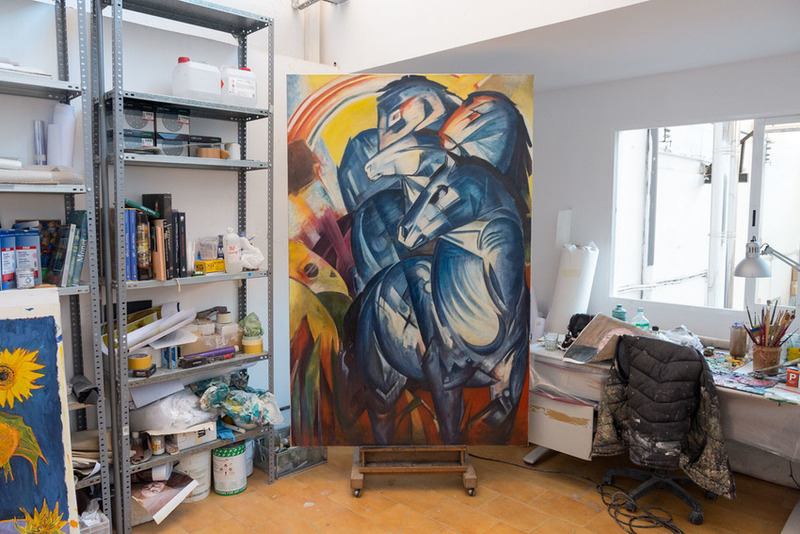 At the studio in Madrid, the best version of The Tower of Blue Horses thus far was photographed at high-resolution. Then this image file was digitally retouched in Photoshop using the colour information obtained in Munich in order to bring the colours of the re-creation closer to Marc’s colours. 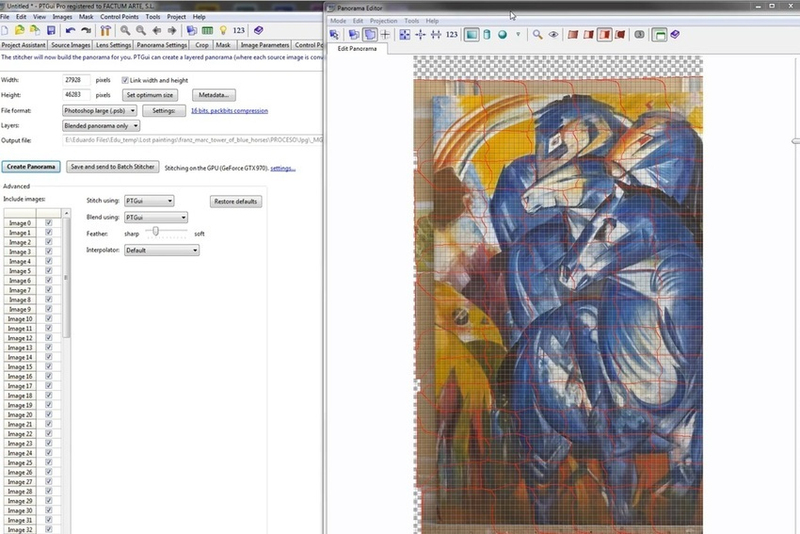 The retouched image file was printed onto canvas. Certain areas with too little information were finished on this new physical version. Then the re-creation was photographed and re-touched once more to make sure every aspect of the painting, came together in the final version. This final image was digitally printed onto a canvas prepped with gesso. Since Marc’s paintings tend to have little relief, the gesso in this case was not texturised in any way. 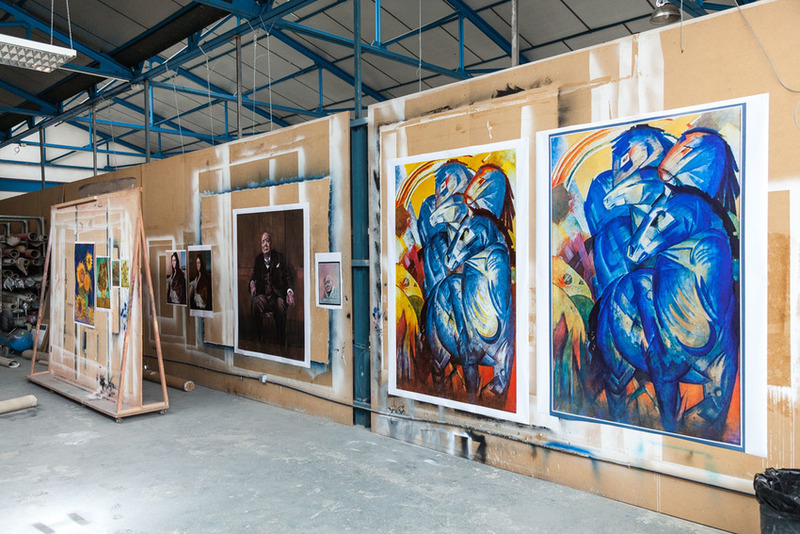 The final print of The Tower of Blue Horses was varnished with wax and given a light glaze in order to impart a more homogenous tone to the colour, one that was closer to Marc’s paintings.